Having decided on the kind of advertising you want to do, you need to know about the different kinds of advertising relevant to the media you are using. Pop-ups and Pop Unders: Usually blocked by most browsers, pop-ups and pop-under ads can still be used in the form of Hover ads that combine a banner ad and a pop-up window in a transparent layer. These cannot be blocked by a standard pop-up blocker. Pop-under ads are also effective because the user sees them only when closes the main window, and therefore it means that his attention is free for the ad. Rich Media Ads: Interactive rich media ads can include games, videos, rollovers, expanding, transitional and takeover ads. An interesting ad can hold the viewer’s attention, especially if there is a higher level of interactive elements in it. Video advertisements: Using videos to advertise a product, or even using Ad sense on an existing video is fast becoming a preferred choice for advertising. Internet users often browse through videos relating to a wide range of topics, and a discreet ad on the video can get a lot of these users to your landing page. Widgets: Promotionals are often advertised in widgets. They contain a short text to tell viewers about a product and have a call to action. Viewers then get to the landing page for more details on the promo. Hybrid Ads: Hybrid ads contain customised solutions with branded promos, interstitials, sponsor messages along with entertainment content. Roadblock: An expensive short-term solution is to buy all the advertising space on a webpage for a limited time, The metrics are similar to a TV media buy and is effective when ,multiple websites run the ad concurrently and therefore roadblocks are very effective in grabbing exclusive viewer attention and engagement. In the world of online advertising, the most important aspect still remains how you plan to circulate your ad. You may use any of the above methods, but at the end of the day, if your targeting is incorrect, these are bound to be ineffective. 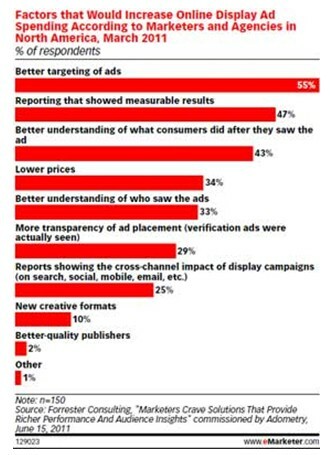 As the following chart will tell you, targeting is what advertisers will spend most on, knowing that will get them better ROI, and once that is in place, choosing the mode of advertising is a call anyone can make.